A power take-off (PTO) shaft transfers mechanical power from a tractor to an implement (shown above). Some PTO-driven equipment is operated from the tractor seat, but many types of farm equipment, such as elevators, grain augers, silage blowers, and so on, are operated in a stationary position, enabling an operator to leave the tractor and move in the vicinity of the implement. A PTO shaft rotates at a speed of either 540 rpm (9 rotations per second) or 1,000 rpm (16.6 rotations per second). At these speeds, a person’s limb can be pulled into and wrapped around a PTO stub or driveline shaft several times before the person, even a person with extremely fast reflexes, can react. 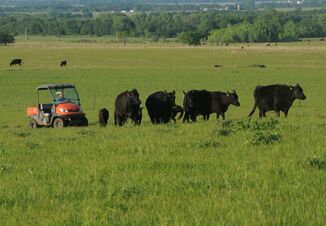 The fast rotation speed, operator error, and lack of proper guarding make PTOs a persistent hazard on farms and ranches. Injuries that can be sustained from PTO incidents include severe contusion, cuts, spinal and neck injuries, dislocations, broken bones, and scalping. Some incidents can result in fatalities. The main PTO hazards involve the PTO stub and driveline. The tractor’s stub output shaft, referred to as a PTO stub, transfers power from the tractor through a drive shaft to the implement or PTO-driven machine. The PTO stub rotates at rate of 540 or 1,000 rpm, and most incidents involving the PTO stub are entanglement incidents. Entanglement incidents can occur when the operator is unaware that the PTO clutch is engaged, when the operator does not understand the dangers of the spinning PTO stub, or when the operator deliberately works close to an unguarded stub shaft that is in motion. Clothing, such as a pant leg, shoelace, thread from a jacket, and so on, is easily caught by the spinning shaft. Once caught, both the clothing and the wearer can quickly wrap around the stub shaft. A PTO driveline or implement input driveline (IID) is the part of the implement drive shaft that connects to the tractor. When unguarded, the entire shaft of the driveline is considered a wrap-point hazard. Some drivelines have guards covering the straight part of the shaft, leaving the universal joints, PTO coupling, and the rear connector, or implement input connection (IIC), as wrap-point hazards. Clothing can catch on and wrap around the driveline. When clothing is caught on the driveline, the tension on the clothing from the driveline pulls the person toward and around the shaft. When a person caught in the driveline instinctively tries to pull away from wrap hazard, he or she actually creates a tighter wrap. In addition to injuries caused by entanglement incidents with the PTO stub and driveline, injuries can occur when shafts separate while the tractor’s PTO is engaged. The IID shaft telescopes, meaning that one part of the shaft slides into another. The sliding sleeve on the shaft allows for easy hitching of PTO-powered machines to tractors and allows telescopic movement when the machine turns or is operated on uneven ground. If the IID is attached to a tractor by only the PTO stub, the tractor can pull apart the IID shaft. If this occurs and the PTO is engaged, the tractor shaft can swing wildly, striking anyone in range and possibly breaking a locking pin, allowing the shaft to become a projectile. This type of incident is not common, but it is more likely to occur with three-point hitched equipment that is not properly mounted or aligned. The first line of defense to prevent a PTO entanglement incident is to make sure that your tractor and machinery have the proper shields. The above photo shows a master shield that covers and extends over the tractor PTO stub on three sides. The master shield provides protection from the PTO stub and front joint of the drive shaft when the PTO stub is connected to the tractor. Before operating PTO-powered machinery, always make sure that the master shield for the tractor PTO stub and front joint is secured properly. Replace a damaged master shield immediately. A PTO driveline shield (shown above) is constructed of plastic or metal and completely encloses the shaft. The bell-shaped ends cover the universal joints on the shaft. The shield is mounted on bearings so that it rotates with the shaft but stops spinning when a person touches it. Check the driveline shield by spinning it to make sure that it rotates freely. If the shield is damaged or does not rotate independently, it does not provide protection and must be replaced. Never step over a rotating shaft. Do not wear loose fitting clothing around PTO-driven equipment. Tie back long hair or secure it under a hat before operating equipment. Ensure that safety decals, such as "Rotating Driveline: Contact can cause death," are readily visible. Replace decals that are obscured or incomplete. Always disengage the PTO and shut off the tractor before dismounting the tractor. Never work on machinery or equipment while the engine is running or is energized. Keep universal joints in phase. Do not switch drivelines between machines. To reduce driveline stress and separation, position the tractor’s drawbar appropriately for each piece of machinery. Reduce PTO shaft abuse by avoiding tight turns, reducing excessive telescoping, engaging power to the shaft gradually, and avoiding over-tightening the slip clutch on PTO-driven machines. Examine the driveline for protruding pins or bolts and debris such as mud that has dried onto the driveline shield. Clothing snags easily on such protrusions, resulting in entanglement incidents. As part of the preoperation inspection, if the driveline shield is equipped with a tether, ensure that the tether is attached and in good condition and that the driveline shield rotates freely on its bearings. Click HERE to view a video by the Alabama Cooperative Extension that explains how to install and maintain a shaft cover on a tractor PTO. Click HERE to view and order safety decals for your PTO driveline from the Agricultural Driveline Manufacturers Association (ADMA). Power take-off safety. (2012) Farm and Ranch eXtension in Safety and Health (FReSH) Community of Practice. Retrieved from http://www.extension.org/pages/66324/power-take-off-safety.